PREPARE ANY DISH FROM ANY CORNER OF THE WORLD! Become the envy of every five-star chef! Now you can become an accomplished cook instantly and prepare virtually any dish with aplomb. Impress everyone with your extraordinary culinary expertise and tickle everyone’s palate with your delicious preparations. We present The Recipe Supercollection featuring thousands of recipes from around the world. With this huge collection at your disposal, you’ll never run out of ideas or recipes for tasty dishes to treat yourself, your family or guests. Learn to prepare meals like the pros in the comfort of your own kitchen with this outstanding 5-volume set. Does your homemade bread turn out with a hard crust? Learn how to prevent this in Volume 1 of The Complete Library Of Cooking. Are the eggs I have still fresh? Find out how to tell if your eggs are fresh in Volume 2 of The Complete Library Of Cooking. I would like to eat more fish but I don't like the bones. How do I filet a fish? Find the answer to this and more in Volume 3 of The Complete Library Of Cooking. What kind of salad should I choose to go with my meal? You will find the answer to this question in Volume 4 of The Complete Library Of Cooking. I love fresh pineapples, but I can never tell if I am getting one that is ripe or not. How do I test for this? Learn a simple test for this in Volume 5 of The Complete Library Of Cooking! Here at last is a much needed set of books designed to instruct and inspire beginning cooks who don't know how to cook and is also a perfect guide for the uncertain cook. This collection addresses the needs and concerns of beginning cooks such as how to shop, how to determine the quality of ingredients, how to store fresh produce and to ripen fruits, what basic kitchen utensils to use, and how not to waste food. Also woven throughout the volumes are delicious recipes to help the beginning or seasoned cook prepare delicious meals. Breakfast is the most important meal of the day. With Sizzling Breakfast Recipes you get 350 mouth-watering, lip-smacking recipes. Whether you want a Sunday brunch or just a quick and easy breakfast, Sizzling Breakfast Recipes is the breakfast cookbook for you. Inside the pages of Sizzling Breakfast Recipes, you will find the traditional breakfast favorites as well as a selection of unique variations. This is the very best of recipes from state fairs around the country. From cakes and cookies and breads to jellies and main dishes this one cookbook has it all. You can't go wrong with a recipe that has been a winner in a state fair competition. Inside you will find as many as 490 award-winning Cordon Bleu recipes from the past as well as some of the newest creations that will surely please your family and friends. Now you can make your favorite Chinese dishes right in your own kitchen! Do you ever get that craving for your favourite Chinese dish, but it was too late to go out and eat or just not convenient? Well, now you can satisfy that craving and make it yourself in the comfort of your own kitchen! This collection of 100 succulent Chinese recipes is just what you need! This collection of 100 Chinese recipes has a neatly organised Table of Contents that makes it easy to find just the recipe you're looking for! Recipes your family and friends are sure to love! It's a fact that food just tastes better outdoors. Now with 101 Camping & Outdoor Recipes, even campers who have never cooked anything more complicated than S'mores can make great meals and snacks over the campfire. You no longer need to sacrifice eating well just because you are not in your home kitchen. 101 Camping & Outdoor Recipes provides you with 101 delicious, and easy-to-prepare recipes for breakfast, lunch, and dinner that are sure to make you a hit around the campfire. If you love to cook and you love the outdoors, then this is the cookbook for you. Prepare yourself for the ultimate taste treat! Throw aside that diet book and join the hot craze that is deep-frying! 101 Recipes For The Deep Fryer will acquaint you with great recipes for cooking in a deep fryer. The high cooking temperature of deep frying seals in flavor and texture and seals out extra fat, resulting in juicy, succulent meats, crunchy vegetables, and satisfying breads and desserts. In 101 Recipes For The Deep Fryer you are sure to find a recipe that will have you deep frying all the time! Now you can go beyond French fries and discover the delicious variety of foods that you can prepare in your deep fryer. Over 500 tasty diabetic recipes, sure to please your taste buds and satisfy your diet restrictions! Millions of people have diabetes and have to maintain a special diet. But this doesn't mean you can't enjoy the things you like; you just have to make them a little differently. Delicious Diabetic Recipes gives you an awesome collection of over 500 recipes! You'll find recipes for things you may have thought you couldn't have any more, like fudge, cakes and cookies. Well, the good news is you can still have all those things. You just need some recipes that tell you how to make those goodies! You don't even have to be a diabetic to enjoy these recipes, anyone wanting to cut down on the sugar in their diet will benefit from these recipes! Homemade Ice Cream has not lost any of its good, old-fashioned appeal. In 131 Ice Cream Maker Recipes, there is a delicious homemade ice cream to meet every need: regular, low calorie, sugar-free and non-dairy. Anyone can make a homemade ice cream to suit his need. Ice cream fills a useful place in homes throughout the world. It is a favourite for desserts or snacks incorporating an array of many flavour variations. With the recipes provided, everyone will be able to enjoy some type of this tempting food. So let's mix up a batch of ice cream for anyone and everyone to enjoy! You just can't match the taste and texture of homemade ice cream. This Collection includes 131 Ice Cream Maker recipes that are sure to delight your senses. Can you imagine the creamiest, dreamiest, yummiest frozen desserts you've ever tasted? Now try to imagine having it all for yourself whenever you want it! 131 Ice Cream Maker Recipes takes homemade ice creams, sherbets, frozen yogurts and sorbets to a new level. Treat yourself to a frozen dessert, order your own ice cream maker recipe collection today. Prepare mouth-watering goodies using oranges! This collection contains as many as 104 easy-to-make orange recipes. Celebrate Valentine's Day with a romantic dinner for two! Valentines Day is a day to express your love, and to celebrate the spirit of love. You will love this absolutely wonderful recipe book for Valentine’s Day recipes. We have some of the best selections for Valentine recipes with 148 all-time favorites. These Valentine's Day recipes are a perfect way to celebrate a special relationship or just treat yourself and your family on Valentine’s Day. Bring the exotic tastes of other countries into your home with Recipes From Around The World. You don't have to travel the world to get a taste of international cuisine. With Recipes From Around The World, you can open your mind and treat your taste buds to a world of fine cuisine-without leaving home! In Volume 1 of Recipes From Around The World you will find over 500 tasty recipes from Germany, Greece, Ireland, France and Russia. Tasty recipes like Galantine Of Chicken from France, Greek Stifado With Feta Cheese Crust, Esterhazy Rostbraten (Beef Sirloin A La Esterhazy) from Germany, Real Irish Stew and Basturma (Georgian Pomegranate Marinated Grilled Lamb) from Russia. Packed with more than 1000 tantalizing recipes from far away lands, the 2-volume Recipes From Around The World set lets you serve and satisfy even the most sophisticated of cravings with inspired meals created fast and easy. Do you want to start living a healthier lifestyle today? Seafood is an important part of a healthy diet, so much so that the USDA has recommended that everyone should make seafood a major part of his or her diet. Seafood is high in protein, yet low in fat and contains Omega 3, which has been shown to help prevent heart disease. Just look at the populations of countries whose major diet is seafood and you will see that they are much healthier. Most people don't make seafood a major part of their diets because they believe seafood is boring or they don't like the taste. This is because they have only tried one or maybe two seafood dishes. But, seafood doesn't have to be boring or not taste good; it's all in the preparation. You can have healthy seafood dishes that taste good with The Ultimate Collection Of Seafood Recipes. And with over 1600 seafood recipes in all (running into a whopping 1044 pages), you are sure to find some that will delight your taste buds and make you a healthier person. Get started today eating healthier and feeling better! [ ] Plus many, many more! Far too numerous to list here. Soups, jams & jellies, chocolate recipes, desserts, cookies, wines & beers, cocktails, puddings, Italian, Spanish, Mexican, crockpot, breads and cakes, cheesecake, coffee recipes, Amish, dipmix, smoothies, fondue, more. This is absolutely the ultimate collection of recipes you’ll find anywhere. 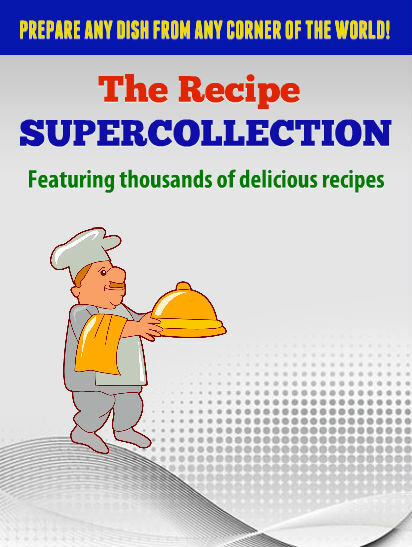 The Recipe Supercollection is a huge bonanza of high-quality recipes in one place. With this great collection, you could even launch your own profitable business such as a restaurant, bakery, catering service or institute. No need to attend expensive cooking classes, no need to buy a hundred cookbooks. All the recipes you’ll ever need are included in this mammoth collection. Most of the recipes in The Recipe Supercollection are in PDF format while others are in text format. You may even print out any recipes of your choice for quick reference. So, how much would you pay for this great collection of recipes that will turn you into a culinary expert and the envy of every chef? All the recipes featured in The Recipe Supercollection would cost you hundreds (if not thousands) if purchased separately (that is, if you could find them!). However, you can have all of them right now for the incredibly low price of only $14.95. Instant access (digital download). Click the "Buy Now" button at the top right-hand corner of this page to get instant access to The Recipe Supercollection right away.